It’s been a while since I’ve played a video game which did not involve mana, either land-generated or crystal-generated). As such, it took me a while to get into Unavowed, the latest adventure published by Wadjet Eye Games. However, after playing my review copy for approximately 32 hours with two player characters and experiencing four different endings, I can say that I’m definitely not going to wait that long before playing another one. Unavowed takes place within the universe conceived within the partially-finished Bestowers of Eternity (2003) and then introduced by Blackwell Legacy (2007), also created by Dave Gilbert and published by Wadjet Eye Games. However, you don’t need to have played either of those games or the four other games within the Blackwell series to understand the world that’s been built. Because there is an already-established universe for its characters, the story that’s been built for Unavowed is very strong. As a mystery, Unavowed does very well at dribbling out hints as to what has befallen the player-character (whose name and gender but not facial features can be chosen during the first scene) during the previous year. It is revealed that not only have you murdered your friends and colleagues, but you’ve also wreaked havoc over New York City by influencing or causing other strange deaths and disappearances. 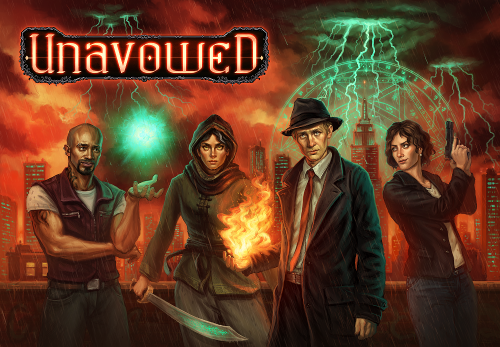 Joining the Unavowed is the only way you’re able to find out what happened to you which is done through investigating sources of demonic energy you (or the demon within you) has left all over the city. I found myself taking a lot of time to read through all of the dialogue, even some of the brilliant “idle stance” dialogue that Gilbert wrote for this non-player characters (NPCs), just so I could figure out more of the mystery and also so that I could unlock the next bit of story which could be uncovered when you speak to certain characters are certain times. One of the big complaints that I’ve often read about point-and-click adventure games is that sometimes a puzzle isn’t intuitive enough for a player to figure it out without a hint. Some hidden object games have chosen to get around that by instituting a rechargeable “hint” bar where if you wait for long enough (or make an in-app purchase) you can get a clue on how to solve a puzzle. Unavowed does no such thing, but instead allows you to ask the other two members of your party what they think you should do next. Their dialogue responses often helped me figure out the next room or person I had to visit. I will state, however, that there were at least five times where I had to resort to performing a “pixel hunt” or consulting the provided walkthrough to figure things out. Whenever I did that, it pulled me out of the story and reminded me that not only was I playing a game, I wasn’t being very smart about it either. And speaking of the dialogue, not only is it written well, it’s also performed very well. In an interview with me, Gilbert said that many of the voice actors he works with have an improv theater background and that professionality shines through. My favorite characters were Mandana and Vicki, not just because they were fully-fleshed out characters and not stereotypes but also because of the personality which Sandra Espinoza (Mandana) and Arielle Siegel (Vicki) brought to their lines. In fact, I love all of the characters in this game because their diversity and diverse personalities are so true to the New York City I called my home for over eight years. It’s also due to the portrait art by Ivan Ulyanov that I was able to empathize with the NPCs so well. Almost every line of dialogue was accompanied by a change in the character portrait that emphasized the emotion being conveyed through the tone in their voices. Best of all, even if you’re a person who has a problem hearing spoken dialogue, the characters’ expressions accurately conveyed the mood contained within the writing. It’s because of this that you can tell that Gilbert spent a lot of time thinking about every line of dialogue. Much of this is due to one trick which he says in the interview was borrowed liberally from Bioware (Mass Effect, Dragon Age) where what you choose as your character’s dialogue has an effect on the NPC’s response back to you. As I was playing the game, I found inventing a personality for both of my player characters based solely on how I thought either of them would respond to a statement or ask a question. This, in addition to the mechanic of being able to pick two NPCs to make up a party help make Unavowed more than just another adventure game. If this kind of adventure game is going to be part of the way forward for Wadjet Eye Games, then not only do I look forward to seeing more games like Unavowed from this publisher, I’m going to expect other adventure game designers to follow suit in their own way. And that, I think, is not a bad thing at all.